Superman, Wonder Woman, Green Lantern. Superheroes. The world longs for them. Always arriving in the nick of time to ward off evil, beat up bad guys, prevent corruption, and promote truth and justice and goodness. The book of Judges is about heroes, the people God used to deliver his people from their enemies. Don’t think of them as people wearing black robes sitting in courthouse with a gavel in hand. I like to think of them as unlikely heroes. Deborah was a woman in a male dominated society. She was a wife and mother who the nation rallied around for her wisdom and spiritual direction. She was personally asked by the general to help lead the army to victory. With no military training she goes with the general into battle to help achieve the victory. We are referring to her as Wonder Woman. Gideon was a coward and had to be convinced over and over that God saw a leader, deliver and “a mighty man of valor” when Gideon didn’t see that at all. He led his nation into battle with overwhelming odds against him but emerged victorious. Because Gideon overcomes great fear we are referring to him as Green Lantern. Samson was the strongest man that ever lived physically. Because of his supernatural strength we are referring to him as Superman. Sampson killed a lion with his bare hands, tore off the huge city gates weighing thousands of pounds and carried them away. He killed a thousand enemy soldiers with nothing more than a donkey’s jawbone. Although he was very strong physically, he was weak morally and spiritually as he regularly made more mistakes than wise decisions. He struggled with drinking and womanizing instead of following God. Talk about action and adventure! These people, and some others, were called judges. God sent them to help his people, the Israelites, when they got into serious trouble. Actually, it was their own fault that they got into trouble. When things were going well, they would get proud and forget God. Sounds a lot like us doesn’t it? Then their enemies would move in and make it tough on them. Eventually, when things got really bad, they would ask God to help them. That’s when God would send a judge. This happened over and over again. As we go through Judges, we will enjoy the thrilling stories of action and adventure. But also learn the lesson that God’s people kept forgetting – to always trust in God and obey him. REAL heroes are hard to find these days. Modern research and the media have made the faults and weaknesses of our leaders very apparent; we search in vain for men and women to emulate. The music, movie, and sports industries produce a steady stream of “stars” who shoot to the top and then quickly fade from view. 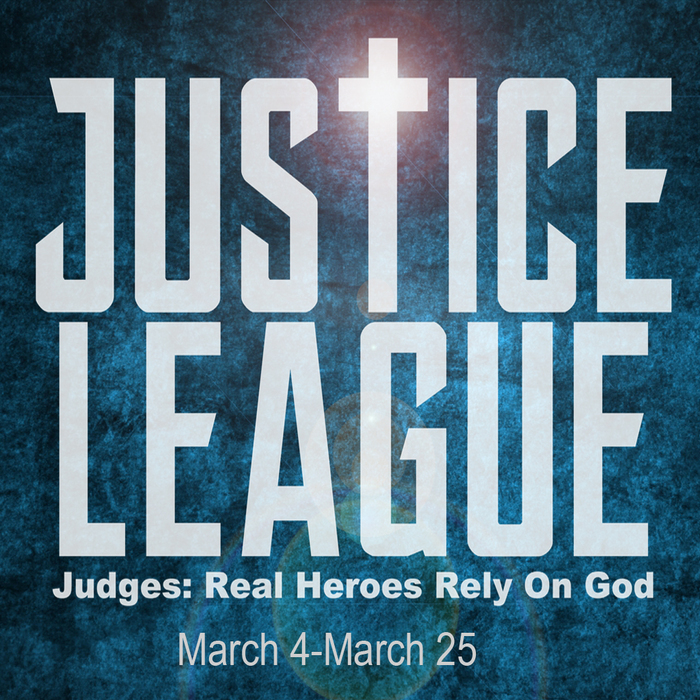 In our series on the book of Judges we are saying that “Real Heroes Rely on God.” God’s Holy Spirit is available to all people. Anyone who is dedicated to God can be used for his service. Real heroes recognize the futility of human effort without God’s guidance and power. Let the book of Judges remind us that God uses normal people to do his work. We can be an unlikely hero to those around us! When you love your wife or husband and serve them, you are a hero! When you teach your children about God, the bible, morality and responsibility you are a hero! When you take or go with your family to church you are a hero! When you love those who are hard to love, when you forgive those who hurt you, you are a hero! Let the book of Judges remind us of the effects of not following God and His word; and let it remind us that, above all, God is merciful to sinful people like the Israelites and us when we ask for forgiveness. I’m excited about this series and hope that you can join us. This entry was posted in Justice League (Judges) and tagged Judges, superman, victory, wonder woman. Bookmark the permalink. Love it! Art imitates Life imitates God’s Story!